LongLocks Salon › Hairstyles and Styling › Prom Hair Styles › How to style easy updos? How to style easy updos? I am looking for updos which can be easy styled by myself. I often have to go out for formal events and don´t want to visit my hairdresser every time (and of course I do not want to pay her three times a month ). The updo should be simple but fantastic. Re: How to style easy updos? Is your hair wavy, curly, or straight? For either of the three, you could always do a French twist. It takes a little fooling around to figure out how to get it to look nice, but once you do, it's fairly quick and easy. And you can always dress it up by adding hair pretties -- since I can't use bobby pins to save my life, I typically hold them up with a hairstick or two, using especially pretty ones for more formal occasions, and plain wood ones for casual. How long is your hair and what is its texture? my hair is rather short at the moment, a few inches more than shoulder length. It is wavy and normal thick. If it does, you could do a few pin curls around your face, and then put the rest of your hair up into a bun or french twist. Most of the updo styles I can think of revolve around buns, actually -- at the crown, at the nape, in between... Braided then put into a bun, plain, with pretty pins added, etc. That reminds me -- I have /no/ idea how easy this would be to do yourself, but a really snazzy up-do I saw once, was a twist braid that started at the nape instead of by the temples, and then terminated in a bun at the crown of the woman's head. Thinking about it, it'd probably be difficult... but it was pretty. I do a modified Gibson that is easy and looks nice, but it won't work with longer long hair. It looks like a Gibson but is done differently. Begin with a low ponytail that is on the loose side. Make a hole in back of the elastic & flip the tail through. Fold the tail into a packet (mine is longer than yours, I fold in half and then half again), you likely will just fold in half or fold the end of the ponytail up. 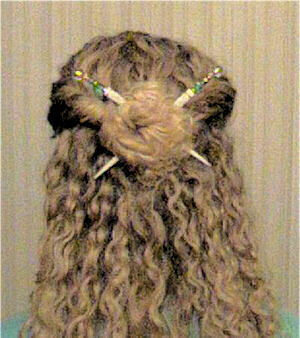 Hold the bottom of the packet and flip it up, stuff the end into the hole from the ponytail. 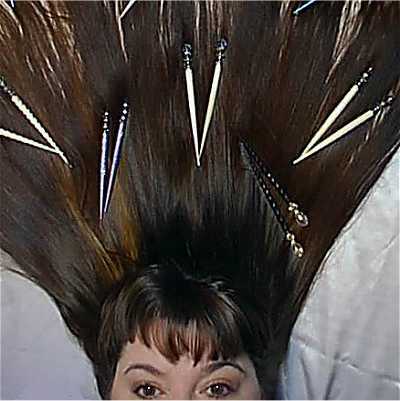 Push enough hair into the hole until the "loop" of hair that shows is to your liking. Hold it (the "loop") in place and fan it out to the left & right. Then pin in place around the top and edges. Add decorations of your choice (I place sticks in an X along the top for decoration and to further secure it). Does that make sense? Also, this is totally & completely pathetic but gets tons of compliments (literally I often get stopped on the street by people who say it looks great and want to know how I did it). Shhhh, I own a fake hair scrunchie (it is called a pouf, it is like a scrunchie but has hair that is about 3 inches long all the way around). I got it at Nordstroms, they have literally at least 40 colors, I have an exact match. I simply lob in on over my bun and add hairsticks to hold the bun. The ends of the you-know-what fan out around the bun and soften it. It could not be easier. Sure, my husband makes fun of the fake hair but I like it!!! I remember this bun it was the lady with the beautiful blond curls, wasn´t it? I´ll try to style all this new ideas and hope they will look great! I like trying lots of romantic/renaissance styles - these sites are great for ideas, and they have instructions with pictures too! my hair stays really easily because it is so curly and somewhat coarse, so I use very few (if any) additional bobby pins unless I'm doing something like the hanging ropes beneath a rope bun or the like - a great product to use for controlling hair when putting it up is Ouidad's Climate Control Gel (you can get it from http://www.oiudad.com) Ouidad is the best stuff for curly hair, and the climate control gel is great for anyone's updo's and controlling frizz regardless of hair type! I went to the sites you suggested but I can't really figure out how you did that bun with the ropes hanging down, the instructions are pretty strange ???... so could you please tell me how you did it? Thanks. Ooh now I get it! Thanks a LOT! It looks really great.. my hair is dark brown and it's curly when it's short but very wavy when long. Anyway you were a great help and might I add you have lovely hair! Why thank you! And it's no problem - there are lots of great variations you can do from the same technique too - have fun experimenting!! !